This fourth and final installment of beastfolk from the BySwarm project includes the last one which is definitely the weirdest – intelligent humanoid bee-swarms. Lupines have formed the backbone of the Sascrian military for generations (even more generations as the Wolfmen reckon). They serve as the mobile, brutal shock troops of Sascria, and are feared abroad as much as they are honored at home. Lupines are fiercely self-confident, particularly when they are part of the Sascrian military, in which they serve as elite shock troops. Posturing and status are very important to every Lupine – they will always seek to determine exactly where they fall in a hierarchy, and will test superiors to make sure they are deserving. Lupines are large and muscular, slightly hunched, and covered with layered fur ranging in color from light grey to nearly black. Their undercoat is white, and they shed relentlessly in warm weather. Lupine eyes are piercing in color and shine golden in the dark when they catch a bit of light. Because of their reputation, outside of Sascria Lupines are often mistrusted and relegated to manual labor or mercenary work. They fall into jobs like bodyguard and bouncer when they have a less adventuresome spirit. Lupines tend toward Neutrality. Their own nature is a balance between fierce self-reliance and pack mentality. They tend to ferociously defend their allies and also hunt their foes without mercy. Within Sascria, Lupines are almost universally Fighters and Rangers, often serving in the Sascrian military or sometimes discharged from it and working as adventurers-for-hire. Outside Sascria, it is rare that Lupines go to school or are fully integrated into society, and they are more often Barbarians. Lupines respect and fear magic, and think of it as something that other people do. There are some, however, who delve into their animal nature and find they have a talent for the ways of the Druid. Lupines often dispense entirely with personal names and go by their epithet instead. Skull-breaker, Scar, Ghost-runner, Shatterbone and so on serve to both identify Lupines and to spread their reputation, whatever it might be. Amongst themselves, they maintain hierarchy with those in authority often coming up with insulting nicknames for those under their command, or simply beneath them in social rank. +2 Dexterity, +2 Constitution, -2 Intelligence. Lupines were bread for endurance and skill rather for deep, rational thought. Sascrian Lupines who tend toward the scholarly life are often simply beaten down by their peers and made to serve in the military anyway. Taste for Blood: Because they eat only meat, Lupines’ meals and cost of living are twice what they would normally be. The extra cost is ameliorated somewhat by the fact that the meat does not need to be cooked. Lupines automatically speak Common as well as the dialect where they received their training – most often, that means Sascrian. 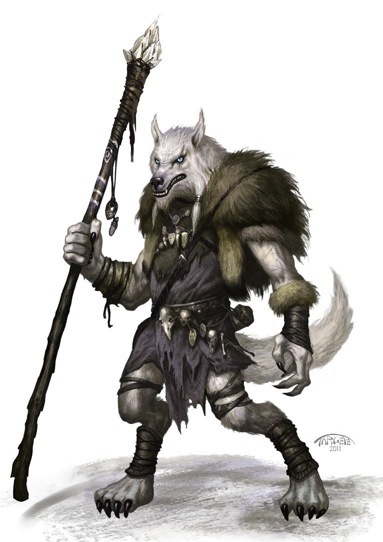 Houndings are the most socially adept Beastfolk, and tend to integrate seamlessly into most Human cultures. Houndings have diverse appearance, depending on the type of domesticated dog they were derived from. The majority, however, are literally hound-ish. Houndings are around the same height as the average Human, but tend to be heavy-boned. Houndings were designed to be like domestic dogs – they really want to get along with everyone, and the do. Houndings tend toward the Good. They natrually tend toward cooperation. Houndings tend to be either filled with wanderlust or complete homebodies. They tend to gravitate toward the Bard class, making the most of their social abilities, or the Ranger, since they are natural, peerless trackers. Houndings often simply take appropriate cultural names, and many of them specifically detest dog-ish nicknames some Humans insist on giving them. +2 Constitution, -2 Intelligence, +2 Charisma. Houndings are tireless and charming, but long generations of domestication of the dogs from which they were created has dulled them a bit. Best Friends: As dogs were domesticated, they became the most adept animals at reading Human emotions and at making their emotions clear to Humans in turn. Houndings gain a +2 racial bonus to Sense Motive checks and Humans gain a +2 racial bonus to Sense Motive when dealing with Houndings. Houndings also gain a +2 racial bonus to Diplomacy, Gather Information and Perform. Bestial Nature: Houndings can communicate with domestic and wild dogs at will. They do not, however, speak wolf. Buzzkin are beastfolk created by mingling human stock with that of honeybees. They were originally created to fill a vital role in the Sascrian Mageocracy’s agrarian workforce, namely they were experts in cross-pollination and the interbreeding of new plant species. There are three sub-types of Buzzkin – queens, drones and workers. Queens are the largest Buzzkin and are responsible for leadership and reproduction in a hive. Drones are the male Buzzkin, and they mate with the queens and do most of the manual labor in a hive. Workers are all females who are not queens – the smallest Buzzkin – charged with much of the labor and defending the hive from intruders. With the exception of queens, Buzzkin rarely work independently, and rather form small teams that act as a single unit. Buzzkins tend to short in stature, and almost childlike in appearance. They have the torso & wings of a bee with the arms, legs, and head of a human, and are capable of flight. Buzzkin tend to prefer warmer climates, and are capable of hibernation in colder weather. Buzzkin drones are able to build hives, pollinate flowers, and produce honey in the same manner as normal bees, while Buzzkin queens are able to birth entire generations of Buzzkin larvae. There are typically only one or two queens born each generation in a given hive, and all but one of the queens are normally driven off and must found their own hives. Sascria’s original intent was to breed only queens and drones – ‘surplus’ female larva were killed off magically and alchemically. Over time, the queens were able to communicate via drone messengers between hives, and hatched a plan to raise a generation of worker-warriors and win their freedom from the Magocracy. The Buzzkin learned the alchemical formulas used to kill the ‘surplus’ female larva and created antidotes in secret, administering them, and raising the resulting female warrior-bees in secret. The revolt was sudden and violent, but once the Sascrian overseers were stung to death, it was an easy task for the Buzzkin to pack up their meager belongings and simply fly away, founding new hives in remote areas of Gondal. There, they opened up limited trade with Humans and other Beastfolk, trading special hybrid crops, honey and alchemical admixtures for raw materials and crafted goods. Many Beastfolk who fled Sascrian captivity ended up living near Buzzkin hives, and alliances were formed, most notably with the Ursians. Over time, the desire grew for vengeance against Sascria, but the idea was rejected time and again because of the incredible arcane power of the Magocracy and the Arcane Schools. Buzzkins are often noted as accomplished artisans and crafters, especially in fields relating to gardening, herbal healing arts, alchemy and the cross-pollination of new plant strains. The Buzzkin share a hive mind mentality with other members of their hive, which they use for limited communication (see racial traits below). Regardless of hive mind connection, however, Buzzkin are very tight-knit and share a very rigid and complex social structure. Under the old mageocracy, Buzzkin queens were accorded status and privilege akin to that usually reserved for artisans, master craftsmen, or even minor nobility, while Buzzkin worker drones were at best treated as a marginalized worker class and at worst treated as a slave caste. Despite being extremely intelligent and quite capable of complex reasoning and problem-solving, Buzzkin worker drones typically have a very limited sense of independence. A typical drone lives to serve his queen and better his hive by performing the tasks assigned to him to his utmost capabilities. The average Buzzkin drone simply wouldn’t choose to seek personal advancement over the advancement of his hive. Buzzkin queens, on the other hand, are allowed far more independence, and are free to act on individual goal separate from those of the hive. They are trained to think “outside the collective” in this fashion so that they may deal with threats to the hive and make decisions that affect the future of their hive. In this manner, Buzzkin queens are praised for their creative problem-solving skills. The new breed of Buzzkin workers seem to fall somewhere in the middle ground between the queen and drone breeds. They are much more self-reliant than drones, but still subservient to their queens. Their role as tacticians also allows them to think in a much more non-linear fashion that the average Buzzkin drone. Buzzkin workers also recognize the need for personal strength and advancement as an extension of their duty to better defend their hives, as anything which makes them stronger also makes them better defenders. Buzzkin have an extremely strong work ethic, and tend to be lawful in alignment. If they have a religion, it is entirely unknown to outsiders. Occasionally a small swarm of Buzzkin workers might develop an independent streak, and these are the most likely to become adventurers. Buzzkin adventurers are most likely to be of the worker breed. Indeed, some worker Buzzkin have begun adventuring as a means of bettering themselves and their hives. Occasionally, a Buzzkin queen might venture out from the hive, either to further her own agendas or for trade or diplomatic relations, but such an expedition will almost always be accompanied by a contingent of worker-warrior guards and drone servants. Buzzkin drones can become superb Alchemists and powerful Bards, though their musical taste is alien to say the least to most Humans and other Beastfolk. Buzzkin workers who take up a life of adventure are often Barbarians, Fighters and Rangers. Buzzkin drone and worker names tend to be short and often involve doubled letters which are attempts to transliterate sounds from the Buzzkin lanugage. Names like Zzak, Riik, Vvrax, and Sevv are common. Buzzkin queen names tend to be just the opposite, usually filled with vowels and very flowery – Lulorieni, Felianne, Siliansili and the like. Drones are always male and workers are always female. -2 Strength, +2 Dexterity, +2 Wisdom. Buzzkin working together are about as strong as other Small races, but they are very nimble and perceptive. Hive Menality: Though the Small swarm is composed of, on average, four Tiny individual creatures, they cannot accomplish anything complex individually – nothing more complex than scouting ahead or gathering tiny objects. Pheromone Communication: Buzzkin can communicate with each other silently as long as they are no more than 10′ apart via pheromones. This is the equivalent of telepathic communication, and occurs at the same approximate rate as speech. Swarm Traits: Small Humanoid Swarms have the vulnerabilities of all swarms. 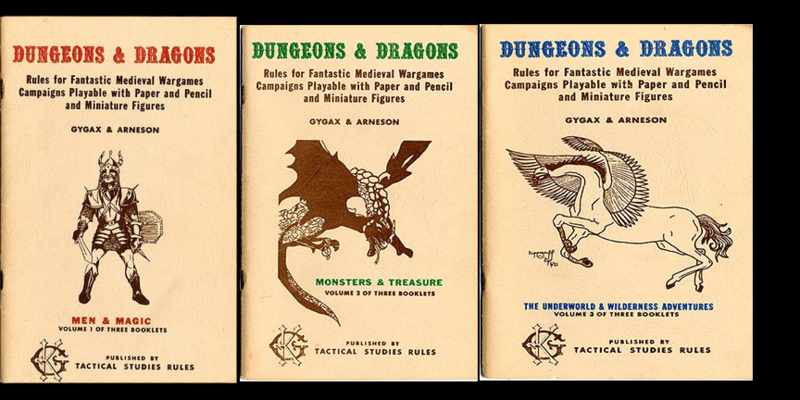 (http://www.d20srd.org/srd/monsters/swarm.htm). Small humanoid swarms such as Buzzkin function for the most part as if they are small humanoids. Small humanoid swarms do not attack by engulfing an opponent’s square in combat, but can attack like any other Small creature, and have a base reach of 1 with any weapon. In combat, each individual memeber of the small humanoid swarm wields a tiny weapon – the aggregate of these multiple tiny weapons are treated as a small weapon for the purposes of calculating damage. Unlike other swarms, a small humanoid swarm is subject to both flanking and critical hits. When there is a rules-related question, treat the small humanoid swarm as a small humanoid creature. Vulnerable to cold: The temperature at which buzzkin must make Survival rolls to avoid damage from cold weather is 20 degrees higher than for other (mammalian) races. Cold attacks deal 150% damage to Buzzkin. Drones: Drones receive +2 to Craft: Alchemy and all of their Alchemical bombs (including alchemist fire/cold/etc. ), extracts and mutagens have +1 to numerical effects or their duration multiplied by 1.5 – chosen at creation. Workers: Worker Buzzkin are individually smaller than drones, but have stingers which drones lack. A worker’s sting is only usable once per day. The workers can attack with their stingers at their full attack bonus, dealing 1d4 damage. If they hit and deal damage, they deliver their poison. The Fortitide save DC is equal to 10 + 1/2 Buzzkin class level + Wisdom bonus. The damage is initial and secondary 1d6 Dex. Unlike their smaller cousins, Buzzkin workers who sting do not die, they simply cannot produce more than one dose of venom per 24 hour period. Ursidians are a race of hulking omnivores originally bred to be elite pit fighters in Sascria. Ursidians can be slow unless they are roused. They are not necessarily stupid, but they are deliberate thinkers and poor negotiators. Bearkin prefer to be solitary, and are not comfortable in large groups, towns and cities. Bear-kin are among the largest Beastfolk ever created. They retain the small, dark eyes of the bear ancestors wedded to tall, powerful, large-boned humanoid frames. Their hands and feet retain claws, but are adapted for more dexterity and for walking upright. Originally, Ursidians and Buzzkin hated each other, but since they have become staunch allies. The Buzzkin’s skill in alchemy and their ability to fly is allied with the Ursidians large size and prowess in battle. Ursidians tend to be solitary, living at most in small familiar groups while they raise children. They are often willing to leave well enough alone, though they are loyal to allies. Bearkin tend toward neutrality. Ursidians who become adventurers most commonly focus on melee combat, playing to their obvious strengths. Since the Collapse, some Ursidians have demonstrated a capacity for divine magic, and become Clerics of their clan totems or of a great bear-god who lives beneath the earth. Lots of long, rounded vowel sounds; attempts to transliterate from the Ursidians’ own language. Brom, Aurorum, Goroom. +2 Strength, -2 Dexterity, +2 Wisdom. Ursidians are large and powerfully built and are close to their animal ancestors, which gives them both a natural insight and wisdom as well as a lack of manual dexterity. 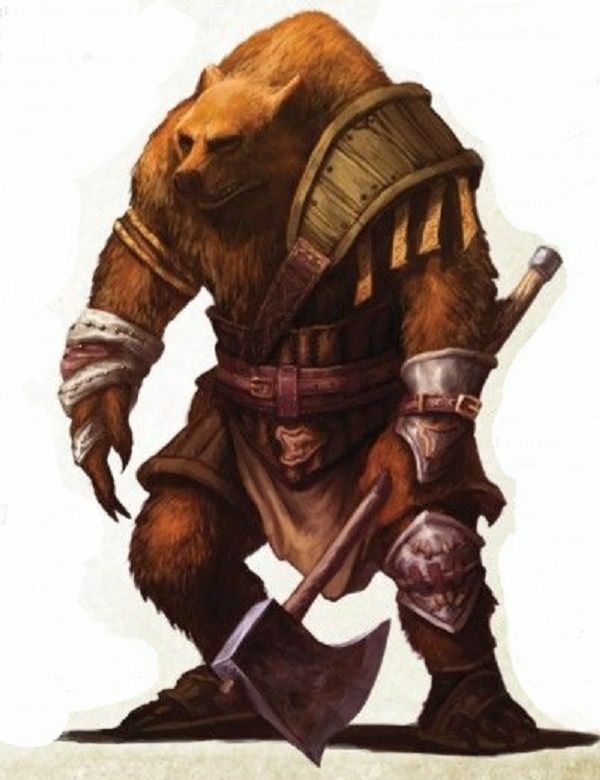 Bear Claws: Ursidians have two claw attacks, each of which deal 1d4 damage and are made at a -5 penalty. Ursidian claw attacks can be made as part of a full attack action as long as the Ursidian has an empty hand. Ursidian claws also give them a +2 to Climb checks. Bestial Nature: Ursidians are able to communicate with bears of all types at will. Hibernation: In cold weather, Ursidians become sluggish and sleepy, and must sleep at least 10 hours per night, and are most comfortable with at least 12 hours. Hulking Frame: Ursidians receive a +1 to both CMD and CMB due to their large size and powerful build – they are hard to disarm, grapple with, or knock down. Ursians also deal +1 damage with two-handed melee weapons. Solitary: Ursidians are not particularly social, and take a -2 penalty to social rolls made in large groups, especially in the case of public speaking. One-on-one or among a few allies, this penalty does not apply. Ursidians speak Common and Sylvan. The Selkies of the Whale Islands have long since left their history as magical experiments behind. Selkies live in autonomous, small communities, always near large rivers, large bodies of water, or the sea. In appearance, Selkies are somewhat similar to Galidines, but where Galidines tend toward high-strung watchfulness, Selkies are simply goofballs. The people of the Whale Islands, the Ardyn, live in peace with the Selkies but do not intermingle with them, except in the area of shared interest – the sea. Selkies are superb swimmers, but they also make natural sailors. Wanting more time to enjoy themselves, Selkies have become masters of aquaculture, raising fish, crabs, frogs and crayfish in netted shallows and weirs along rivers. 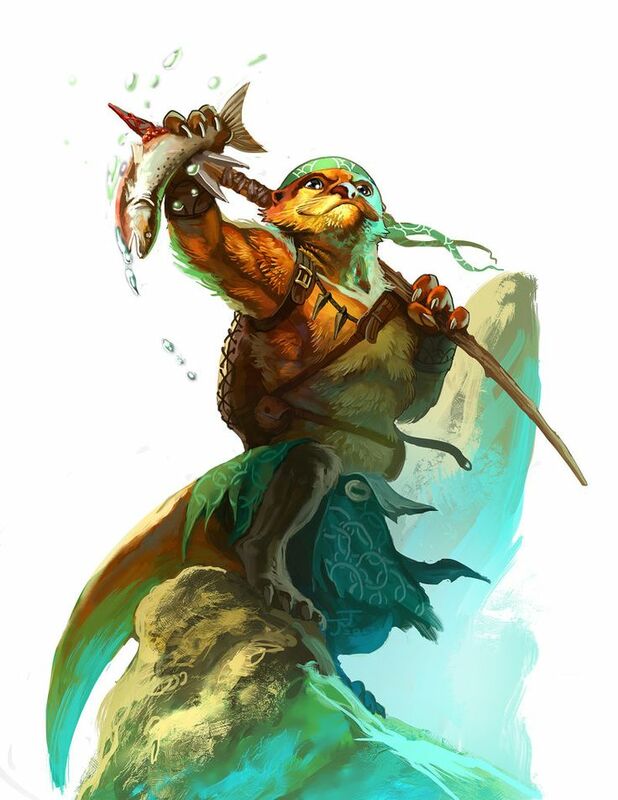 Unlike the Galidines they sometimes resemble, Selkies were not originally bread primarily for fighting, and so while they do have some sharp teeth, they cannot make bite attacks in combat. As mentioned above, Selkies tend to be fun-loving and playful, and have trouble treating anything but a life-and-death situation very seriously. Many of their cultural advancements have been aimed at creating more free time for themselves, and any technology or practice that creates more work is readily abandoned by Selkie communities. Selkies can be laid back, but will make sure that they goof off at least once a day. This goofing off may or may not create some trouble – Selkies who get into trouble are often a bit surprised by it, as if they assume that everyone is as easygoing as they are. Selkies look a bit like Galidines with long, flexible, sleek bodies – but of course Selkies will maintain that they are far better looking. Selkies have wide hands and webbed feet to help with swimming, and long, powerful arms that they use to propel themselves through the water (which, in a pinch, can also swing a weapon pretty hard). Selkies get along well with most Ardyn, the humans who live with them on the Whale Islands, and when they travel to other places, they can often fit in relatively well anywhere. Selkies just don’t appear very threatening to most people, whether they are trying to appear threatening or not. You have to travel a long tie to find a Selkie with a Lawful bone in her body – Selkies are creatures of Chaos, and often tend toward the Good, preferring to live in peace and plenty but willing to help those in need when they are able. Neutral Selkies tend to prank and joke for the sake of pranking and joking, and often at inappropriate times. Evil Selkies certain exist, and they see all of life as one big joke – and they are determined to have the last laugh, no matter who else it hurts. Selkies love music, and make excellent Bards. They also tend to eschew many of the trappings of Human civilization, making them prefer the life of the Barbarian or the Ranger. Occasional Selkies feel the call to become an Oracle, and they almost always worship their own version of the Trickster deity. Many Selkie communities will also have a Witch who provides useful spells and periodic healing. Selkies have their own language, adapted for use underwater, that almost no non-Selkies know. Their real names are in this language, and they only use it with each other. With outsiders, Selkies tend to choose odd, descriptive names like Shell-cracker, Swift, Bubble, Sharp-tooth and Fisher. Bestial Nature: Selkies are able to communicate with otters at will. Natural Swimmers: Selkies have a swim speed of 20 and are extremely maneuverable underwater. They can hold their breath and remain highly active for 5 times longer than a Human. Selkies begin play speaking Common as well as their own language, Selkie, which they only use with each other. The Ophidans are a sly race of Beastfolk uniquely designed to be assassins. They were created by the School of Metamorphosis as a hybrid of snakes and humans. Though the original Ophidans were made by using specific snakes, they were modified over time to have the maximum of reflexes, senses, and venom, making them much more deadly than they previously were. As these modifications were made, the Ophidans were also changed to minimize the outward appearance of their serpentine relation, causing them to become unstable and short-lived. The average Ophidan may live twenty to thirty years before they completely unravel and die. Ophidans tend to have solitary natures, but can very easily put on different faces. It’s thought that compulsive lying is a trait among many Ophidans. Ophidians are cold and calculating, and sometimes have trouble understanding the mammals around them. Decisions for Ophidians are always clear-cut, black-and-white affairs, and if they take the concerns of allies or family into account, it is because they learned how. The wizards who created the Ophidans created them to be as human as physically possible, so very few serpentine traits remain still. Their eyes are one of their main defining features- all Ophidans have slit pupils, though the distribution of the amounts of which snakes they mix with the most determines the direction in which the pupil is slit and the color. The same factor will determine their hair color, though most Ophidans have extremely fine hair. Most Ophidans will wear their hair relatively long, though they will cut it short from mourning. They also have fangs and slightly forked tongues, causing many Ophidans to have a subtle accent. Though almost all Ophidans are fair-skinned, some will have small patches of scales on their wrists or necks. Females of their race will usually be a height of 5’4” to 5’9”, and males will usually be of a height between 5’7” and 6’. During the magocratic society, most Ophidans were assassins, thieves, or otherwise used in stealth operations. They used a clan affiliation amongst themselves, defining themselves by their families. Despite their reputation for being incurable liars, which is, to some extent, true, they are extremely loyal to their families, or, in more recent times, employers. Since the collapse of magocratic society, some of the Ophidans have maintained their affiliations, while some have broken free and become loners, though many Ophidans prefer to stay out of sight and with their clans. Even in societies that accept or relatively accept the Beastfolk, most Ophidans are treated with mild suspicion and disdain because of their former employment in the magocratic society. The opinion of them is slowly changing in more war-torn lands, where they prove themselves to be capable and surprisingly loyal warriors, but most Ophidans keep minimal contact with society as a whole because of relatively poor opinions of them. Ophidians, designed to be killers and naturally callous, tend significantly toward Evil. Ophidians most often become Rogues. Some leverage their natural hunting instincts to become effective Rangers. Lots of fricatives and especially sibilants. Bestial Nature: Ophidians can speak with serpents and vipers at will as a magical ability. Not every attempt at creating beastfolk went as planned – not by a long shot. In most cases, the experiments were altered or aborted entirely. Lost resources were simply chalked up to the cost of creating new and exciting slaves for the pits or for other kinds of service. The Pantheria are an example of how things can go terribly wrong indeed. Pantheria are either lone hunters or form into small familial prides. They retain enough intelligence and human nature, however, to band together when faced with an outside threat, and some Pantheria build homes and use simple tools. Others are more lost to their animal natures and stalk their island as highly intelligent apex predators. Pantheria are long-boned and lithe and have the relaxed musculature of the great cats, capable of bursts of tremendous speed and strength when needed. In coloration, they take after one of the families of great cats – lions, tigers, leopards and jaguars. The Pantheria sometimes tolerate trade with other beastfolk, as long as they do not appear to be easy prey, in which case they are eaten. Pantheria consider Humans to be relatively unappetizing, but would rather devour them than speak with them. One of the few tenets of their society that they maintain is their white-hot hatred of Human magic and Humans in general. Pantheria follow their own animistic religion of the hunt and of the renewal of nature. They believe that by devouring an opponent or rival’s heart and other key organs, they gain his or her power for themselves. From a Human point of view, they tend toward Evil, though of course the Pantheria do not see it that way. Pantheria who have PC classes obviously tend toward Barbarians and Rangers. Religious leaders of the Pantheria are almost exclusively female, and they are often Druids or Witches. Few Pantheria if any leave their island home to adventure, though it is not unheard-of for young males seeking status as manhunters will cross to the mainland and make raids on outlying villages, carrying back treasures and trophies alike. +2 Dexterity, -2 Intelligence, +2 Wisdom. Pantheria are nimble and athletic, and are more bestial than other beastfolk. Bestial Nature: Pantheria can communicate with any great cats at will because of their bestial background. Domestic cats are naturally terrified of them, but they can communicate as well. Failed Experiment: Pantheria, rather than being susceptible to mind-controlling magic, turned out to be resistant to it, and because of this were able to gather their strength and win their freedom in a bloody rebellion. Pantheria have a +2 save bonus to all [Mind-affecting] spells. Primitive: Pantheria do not trust things they associate with Humans, including some simple technologies. Pantheria cannot use Crossbows and do not wear metal armor, though they do make use of metal weapons. Pantheria also begin play illiterate – in order to become literate, a Pantheria must spend a skill rank. Red in Tooth and Claw: Pantheria have two claw attacks and a bit attack which can be used as part of a full attack. Each claw deals 1d4 damage, as does their bite attack, and all are made at a -5 to their base attack bonus. Pantheria claws give them a +2 bonus to Climb checks. Testudo are humanoid tortoises created by School of Metamorphosis Wizards before the Collapse to be effective wartime workers during a time when raw materials for armor were becoming scarce. It was decided that, given the relative ease of magical manipulation and availability of slaves, it might be beneficial to grow armored workers rather than pay to equip them. After the war was over, they Testudo were left to their own devices. Though they are heavyset and have the carapace and plastron of their tortoise ancestors, the Testudo tend to be bookish and quite conservative, and most of them eschew adventure. They are long-lived – no Testudo has yet died of old age, and they were created over 200 years ago. Testudo are universally vegetarian, and aggression does not come naturally to them. The reproduce by laying and fertilizing one large egg at a time – as long as the egg’s internal temperature is maintained, it does not have to be actively cared for. Hatchlings that result, however, are cared for assiduously. Testudo are not entirely reptilian. Tesdudo tend to be bookish and conservative, concerned with lore, organization, and in things remaining much as they are. Testudo are not wont to challenge authority, nor are they prone to be innovators. They are conservators, and often feel that much of what Humans forget is in fact precious. Testudo carefully consider their options before choosing. Though they are not true reptiles, Testudo retain the plastron and carapace of their tortoise ancestors. This means that they are wider and bulkier than other races, though not significantly heavier on average. Unlike tortoises, Testudo cannot pull their limbs inside their shell – it is a good bit of protection nonetheless. Testudo have short, thick fingers and toes and broad hands and feet. Their arms and legs tend to be short, and they never grow hair. Testudo potentially get along with everyone, as long as you are not too loud and don’t make a lot of sudden moves. Galidines can make Testudo nervous, but they are useful for running and fetching things when the Testudo can’t be bothered. Testudo are quite Lawful, and do not tend toward great altruism nor are they particularly malevolent. If virtue is the balance between extremes, then Testudo are the picture of virtue. Testudo are superb Alchemists when they try their hand at the art, and some even become Bards since they enjoy both gathering lore and knowing a little bit about everything. There is a school of Testudo Monks who practice a hard-hitting, methodical form of martial arts, drawing upon the strengths of their odd physiology. Testudo who have an interest in religious lore sometimes become Paladins, devoting themselves not only to a particular religious path, but also to the preservation of traditional values in general. Testudo might be encountered in any urban area, and simply choose appropriate names from the local culture. -2 Dexterity, +2 Constitution, +2 Intelligence. Testudo are large, strong and resilient, but lack agility and can be slow to act. Bestial Nature: Testudo are able to communicate with turtles and tortoises at will. Bookish: Testudo receive one free Knowledge as a class skill at character creation, regardless of class. If all Knowledges are already class skills, then the Testudo receives a +2 to a Knowledge of her choice. Resistant to Change: Testudo receive a +2 to all Will saves. They are very hard to convince or sway by any means. Slow Breath: Testudo receive a +2 racial bonus to Concentration, and they can hold their breath 5 times longer than a human with the same Constitution score. Sluggish: A Testudo’s base movement speed is 20. Testudo in heavy armor just don’t get around. Testudo speak Common as well as the Sylvan language that is common to Beastfolk of all kinds. 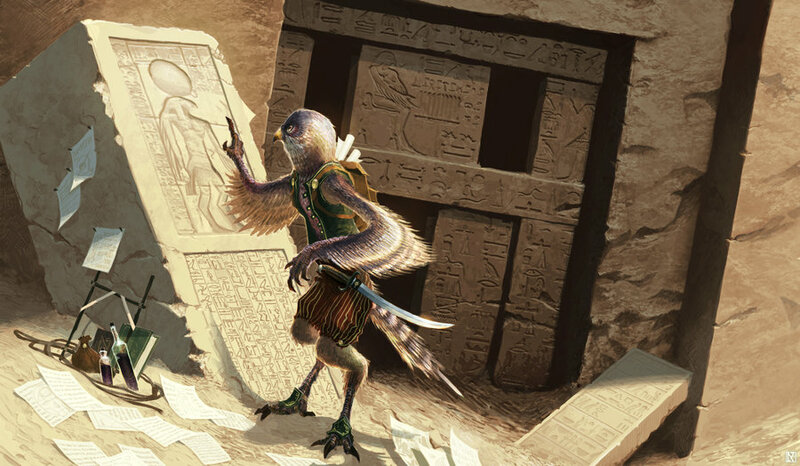 The Hakinu are a species of beastfolk that resemble humanoid birds of prey – hawks, eagles, falcons and owls. Medium – While slightly taller and slimmer than average humans, they are still of medium size. Low-Light Vision – All egalit have can see twice as far as humans in dim light. Keen Senses – Egalit receive a +2 racial bonus on all Perception skill checks. Shinies – Due to their attraction to shiny objects, egalit receive a +2 racial bonus on Appraise skill checks for any object with metal or gems. Bestial Nature – Due to their animalistic connections to their past, Egalit can speak with natural birds of prey at will as a supernatural ability. Talons – While egalit have human-like hands, their fingers end in powerful talons that are useful for grasping and holding opponents. They receive a +2 racial bonus to CMB and CMD for grapples. They also receive a +2 racial bonus to Climb checks. Sharp Eyes – All Egalit share incredible long-distance eyesight. On a clear day, an Egalit can see detail over a mile away. This does not mean that Egalit are better at sensing ambushes nearby; it only means that when an Egalit focuses on a distant object, she can see detail long before a Human could even see the object. A few years ago I was part of this cool collaborative game design project called BySwarm. Basically, it was crowd-sourced RPG design and worldbuilding, open to anyone who came to the website and wanted to be part of it. It went amazingly well and was a great experience. Unfortunately, the ultimate goal was to publish a Pathfinder module in our new setting and go from there, but the project didn’t come to full fruition. One thing we did was design a lot of cool beastfolk-style races for our setting using the initial version of the race design system that is in the Race Guide. They’re all work I’m proud of, and not just because I contributed a lot of that work. They’re also the kind of thing that might be helpful to other DMs and GMs putting together their own settings, so I’m sharing them here. The project has been defunct for a few years now, but if it comes to it, all rights reserved, BySwarm LLC. There are a lot of races, so this will be a three-part series. Galidines are beastfolk who were developed from human-mongoose hybrids. They were magically designed for enhanced reflexes and employed as thief-catchers. Galidines are high-strung and honest to a fault, often trusting strangers a bit more than they should – until that stranger gives them reason to mistrust them, at which point they will be subjected to eternal vigilance and skepticism. Galidines take a critical and even scientific viewpoint in most situations, and want to be offered proof and evidence in all situations. This can be a virtue when Galidines are involved in tracking or investigation and a hindrance when they are called upon to make small-talk. Galidines have light-colored fur and tend to have a lanky, thin build. They almost never appear to be at ease – their stance and expression bespeaks readiness and watchful intensity, and relaxing comes to them only with difficulty. Galidines and Ophidians have an intense mutual hatred, which one would expect given their respective backgrounds. Aside from Ophidians, Galidines tend to judge each new person they meet on their own merits. They value honesty very highly, and readily give their trust as long as they have no reason not to. When betrayed or lied to, however, it is almost impossible to win the trust of a Galidine back. Many Galidines are Lawful in alignment and few are Evil. Because most Galidines are skeptical, critical sorts, they do not naturally gravitate to religious belief. The intervention of the gods and various spirits does not seem to be dependable enough to a Galidine, who values regularity and dependability. Though they normally shy away from outright crime, Galidines make excellent Rogues. 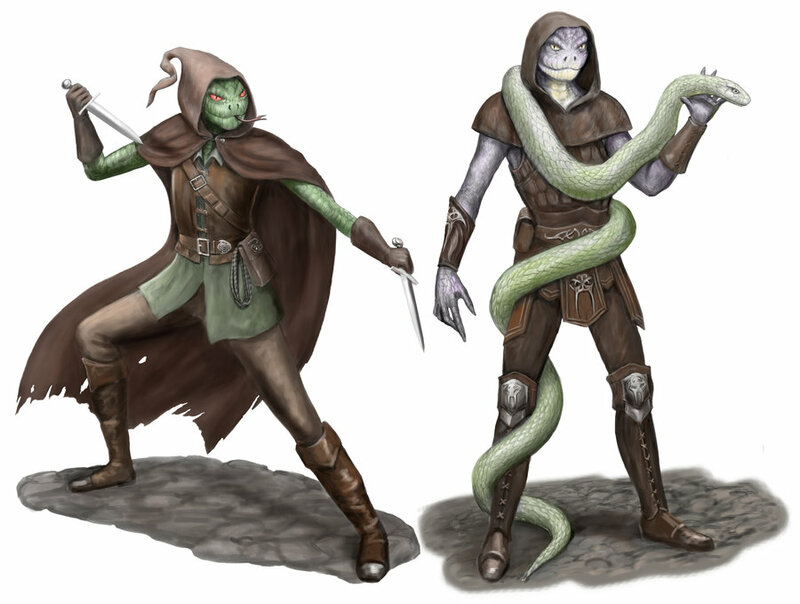 Galidine adventurers are also often Rangers and Fighters, focusing on fighting in light or medium armor and using their agility and intelligence to outwit opponents. A few Galidines have discovered arcane magic and have begun training as Wizards – this was not a legal option for them in old Sascria, but since the Collapse and the spread of beastfolk across Gondal, many new options have opened up to them. +2 Dexterity, +2 Intelligence, -2 Wisdom. Galidines are nimble and clever but often lack insight and tend not to trust their own intuition. Bestial Nature: Galidines are able to communicate with mongooses, though mongooses are rare. Galidines also receive a +1 to all attack rolls made against Ophidians. High Strung: Galidines get one extra attack of opportunity per round – 2 without the Combat Reflexes Feat or their Dexterity bonus +1 with the Feat. They also receive a +2 racial bonus to Initiative. Galidines begin play speaking Common and one local language from the country or region in which they were raised. Muroideans, more commonly know as Ratkin, Ratfolk or Ratlings, are, as their common monickers imply, Beastfolk designed by School of Metamorphosis Wizards before the Collapse. It began as a common kind of experiment – scholars observed the tenacity and resourcefulness that rats showed in reaching and devouring food stores. Strategists felt that a rat-based hybrid might be useful as sappers or saboteurs. One thing they did not take into account was that rats also have a very rapid reproduction rate to go along with their resourcefulness. A few escaped and…propagated. Regardless of the original plans for them, they are now a very common race of Beastfolk, found in any urban area, living as scavengers and improvisers. In Sascria, Ratlings, as they are called, are hardly seen as sentient by most Humans. They are treated much like the rats they are derived from – though they are certainly a more dangerous version. There are standing bounties on Ratlings – their tails are collected and can then be turned for gold or favors from powerful organizations. Muroideans are hardy, resourceful and cunning. Generosity is not something that comes naturally to them, and it is only rare that one will demonstrate what might be called “camaraderie”. They are materialistic, and always know what is theirs as well as what they want. Single-minded in seeking a goal, they are also always wary of rivals and other threats. Muroideans are smaller than Humans, standing on average 3-4 feet tall. They have a hunched posture and long feet with long toes ending in claws and they have claws rather than fingernails on their long-fingered hands. Muroideans’s noses are almost perpetually moist and their eyes tend to be pale in color. In Sascria, Muroideans are treated little better than large vermin, and are considered a pest species unless they are specifically in the employ of the Sascrian government or one of the Arcane Schools (in which case, they carry papers and are forced to proffer them at every turn). Outside Sascria, some of this stigma persists, but they are not hunted anywhere else like they are hunted at home. Some might think of Muroideans as tending toward Evil because they have learned that being selfish will sometimes be all that keeps them alive in a hostile environment. They are also always the ‘underdogs’, and because of this they have learned to fight suddenly and viciously and to flee when possible. In a situation where they do not feel their lives are always in danger, some Muroideans might even learn some altruism, or at the very least, to live-and-let-live. Constantly under threat in Sascria, however, they are vicious and mistrustful. For the Muroidean, the life of the Rogue is almost an assumption. 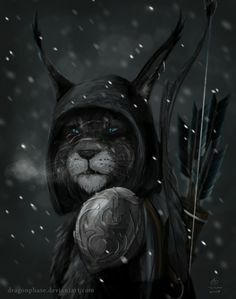 Many Ratlings who get the better of their hunters, however, have turned to the study of the arcane arts as either Wizards or even Alchemists, stealing and hoarding Sascrian texts and putting their secrets to use. Outside Sascria, these arcane Muroideans have the best chance of gainful, lawful employment. Muroideans tend to choose vulgar forms of Sascrian names. Small-sized. Muroideans are small in stature but very fast, particular when frightened, and their movement speed remains 30. -2 Strength, +2 Dexterity, +2 Intelligence. Though they are small, Muroideans are nimble and far more intelligent than the Sascrians who hunt them assume. Bestial Nature: Muroideans can communicate with small rodents at will. 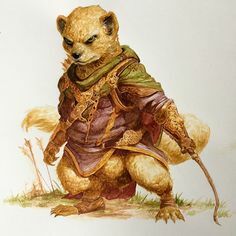 Scamper: A Muroidean receives a +2 bonus to Climb and Stealth checks. Muroideans also take a -2 penalty to saves against fear effects – they are naturally prone to flee danger and err on the side of living to fight another day. Versatile: Muroideans are automatically proficient with improvised weapons. Voracious: A Muroidean can eat anything that is even remotely edible. Because of this, the cost of their meals and standard of living is 50% of normal. Muroideans also receive the Scent ability, and rely on their keen noses in complete darkness. 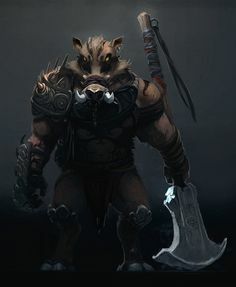 Boriwogs are beastfolk that resemble human-boar hybrids. They are known for their ferocity and toughness, and they were typically used as guards or even a sort of mercenary slave before the Collapse. Boriwogs tend to be vain types, fastidious and careful with their clothes and hygiene. Amongst themselves, Boriwogs are prone to duel over minor insults. They are often gruff and intolerant of prejudice against boriwogs or other beastfolk. Boriwogs are broad, stocky, and about as good-looking as one can imagine when dealing with the concept of “porcine.” Instead of hair they have long, semi-flexible bristles which some enjoy manipulating with pomade and various dyes. Others go with a more insane look to increase their intimidation factor. Of the beastfolk, the Boriwogs are some of the most likely to find a place in larger Human society, often as personal bodyguards. Many would rather go hungry than work as menial laborers, even though they have the physical strength for it. Some Boriwogs also show a capacity for scholarly pursuits. Boriwogs have an independent streak, and lean toward the Chaotic, valuing personal expression and independence that can turn a simple dispute into a deadly fight. Naturally, Boriwogs tend to become Barbarians and Fighters, and some also become Cavaliers, riding through battle and enjoying how much attention they can draw to themselves. A few Boriwogs have dabbled in the arcane arts of the Wizard, and those who do are attracted to the school of abjuration. Rolling Rs and long, round vowel sounds – Rombol, Borion, Kamor, Olgram, Gortrund. +2 Constitution, +2 Intelligence, -2 Charisma. 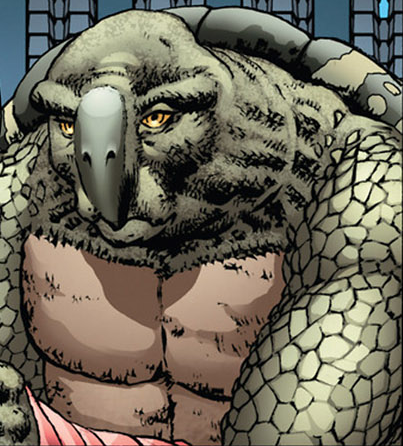 Boriwogs are large and powerfully built and they possess surprising porcine intelligence. Despite their preoccupation with appearance, however, they are still pigs. Medium – These medium size creatures are typically a little shorter and stouter than the average human. Bestial Nature: Due to their animalistic connections to their past, Boriworgs can speak with boars and domestic pigs at will as a supernatural ability. Many Boriwogs would never do this in public, however. Charge! : When a Boriwog charges, she receives a +1 racial bonus on a single melee attack made at the end of the charge. Additionally, she receives a +1 racial bonus on a single CMB roll to bull rush at the end of a charge. Tusks: Boriworgs grow tusks from their elongated, boar-like faces. These tusks are considered a light slashing weapon that do 1d3 damage and may be used during a full attack action at -5 to the character’s base attack bonus. Boriwogs begin the game speaking Common and Sylvan.